PI001. 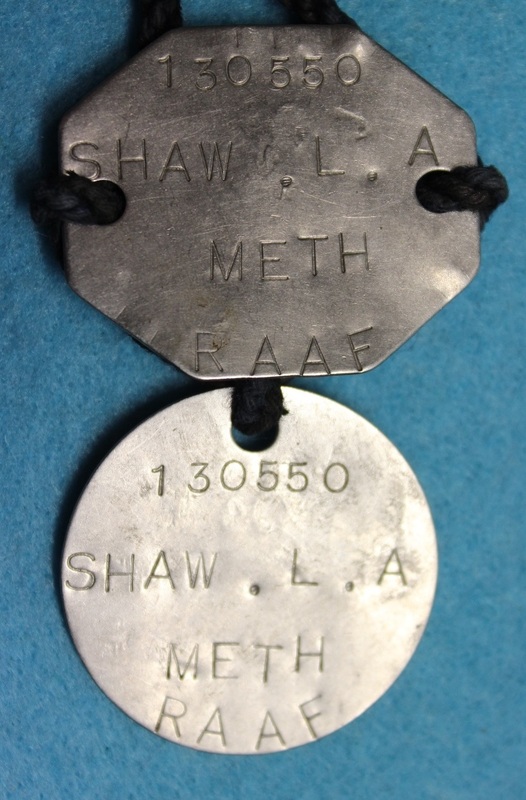 A pair of official identity discs stamped 130550 SHAW L. A. METH RAAF 04. Leslie Arthur Shaw enlisted on 2 Feb 1943 at Sydney and discharged with the rank of Corporal on 7 Nov 1945 from No 8 Postal Unit. PI003. A pair of sterling silver identification discs engraved 108636 Shepherd. L. W.A.A.A.F. C of E 04. Leslie Shepherd enlisted on 4 Feb 1943 at Sydney and discharged with the rank of Aircraftwoman on 27 Nov 1945 from Headquarters Eastern Area Sydney. PI004. 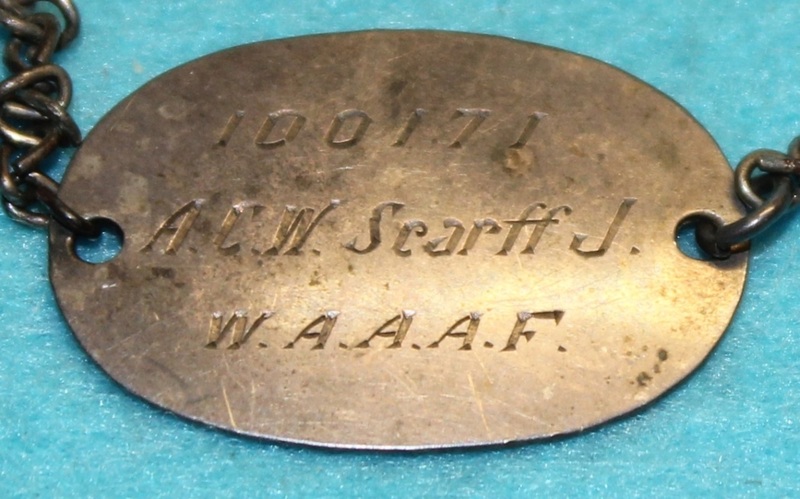 A small square identification bracelet engraved R.A.A.F. 51428 Edwards K. M. Nhill Victoria Pres A2. Kevin Murray Edwards enlisted on 2 Mar 1942 at Melbourne and discharged with the rank of Corporal on 2 May 1946 from C & MU Mount Gambier. PI005. A small oval sterling silver identification bracelet engraved 149088 WILKINSON P. L. R.A.A.F. 1945 04. Peter Leslie Wilkinson enlisted on 10 May 1944 at Melbourne and discharged with the rank of Leading Aircraftman on 22 May 1946 from No 1 Stores Depot. PI028. 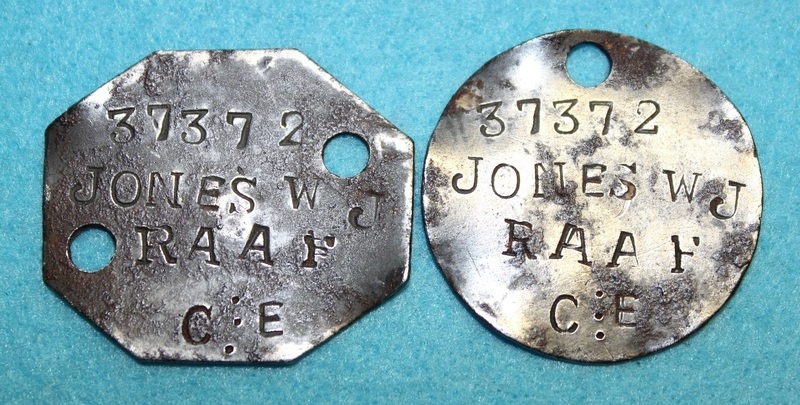 A pair of unofficial identity discs stamped 37372 JONES W J RAAF C.E B3. William John Jones enlisted on 17 Jun 1941 at Sydney and discharged with the rank of Leading Aircraftman on 22 Nov 1945 from 102 H/B Squadron. PI029. A Stirling silver identification bracelet engraved 100171 A.C.W. Scarff J W.A.A.A.F. 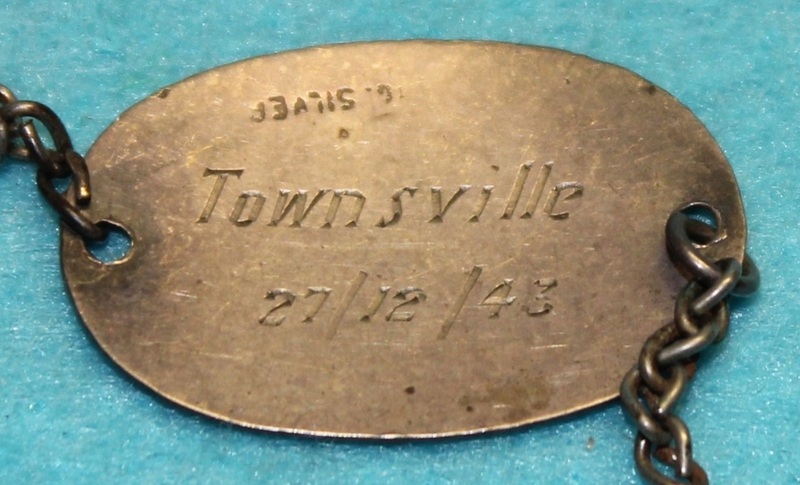 Townsville 27/12/43. Jean Elizabeth Scarfe enlisted on 15 Jun 1942 at Brisbane and discharged with the rank of Aircraftwoman on 6 Feb 1946 from the Central Photographic Establishment. PI029. Back view of bracelet. PI051. 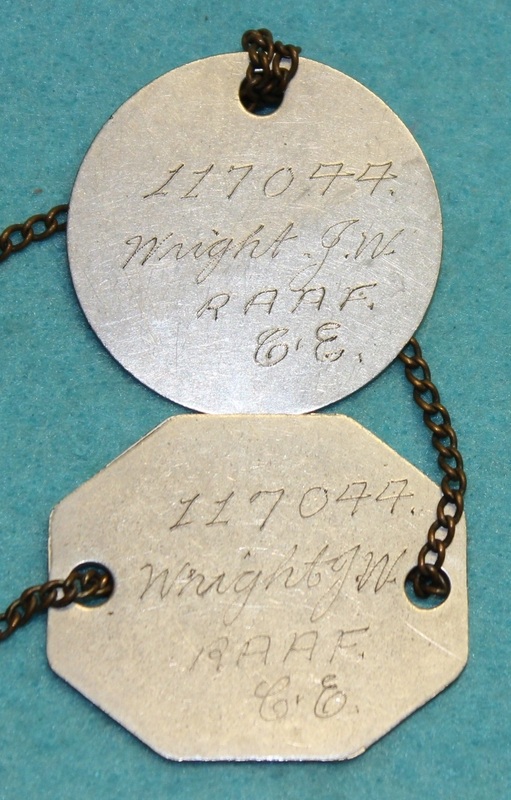 A pair of official identity discs engraved 117044 Wright J W RAAF CE A2. Walter John Wright enlisted on 7 Aug 1942 at Melbourne and discharged on 17 Oct 1945 from No 80 Squadron as a Leading Aircraftman. PI052. 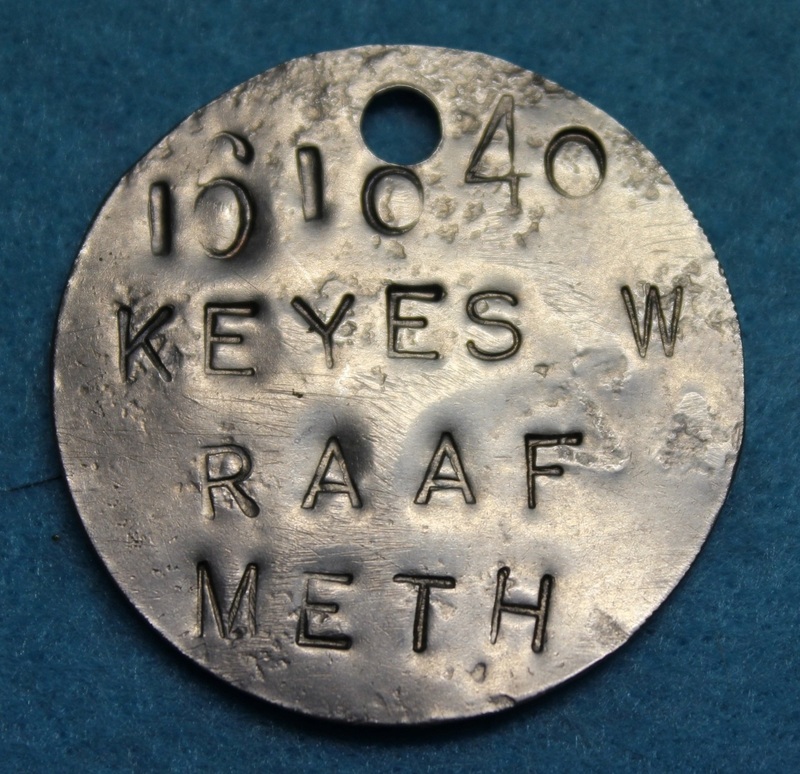 A single circular official identity disc stamped 161040 KEYES W RAAF METH A2. Wilfred Alexander Keyes enlisted on 11 Feb 1944 at Sydney and discharged with the rank of Aircraftman 1 on 9 Jun 1944 from Headquarters Sandgate. PI053. 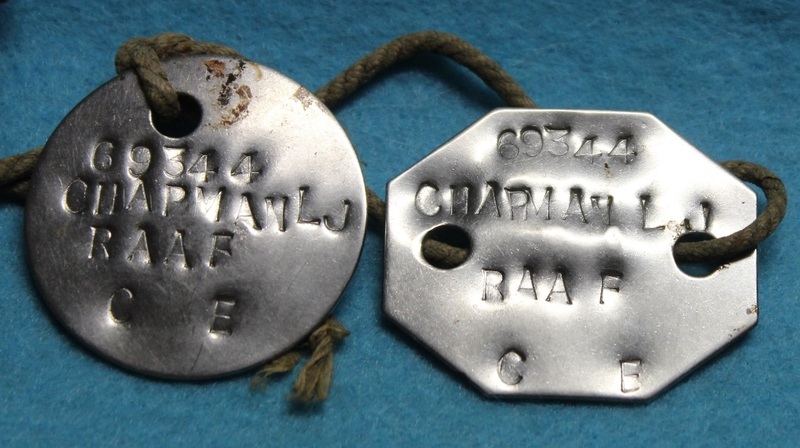 A pair of official identity discs stamped 69344 CHAPMAN L J RAAF C E A2. Lewis John Chapman enlisted on 26 Aug 1942 and discharged with the rank of Corporal on 8 Oct 1946 from Air Force Headquarters. PI054. 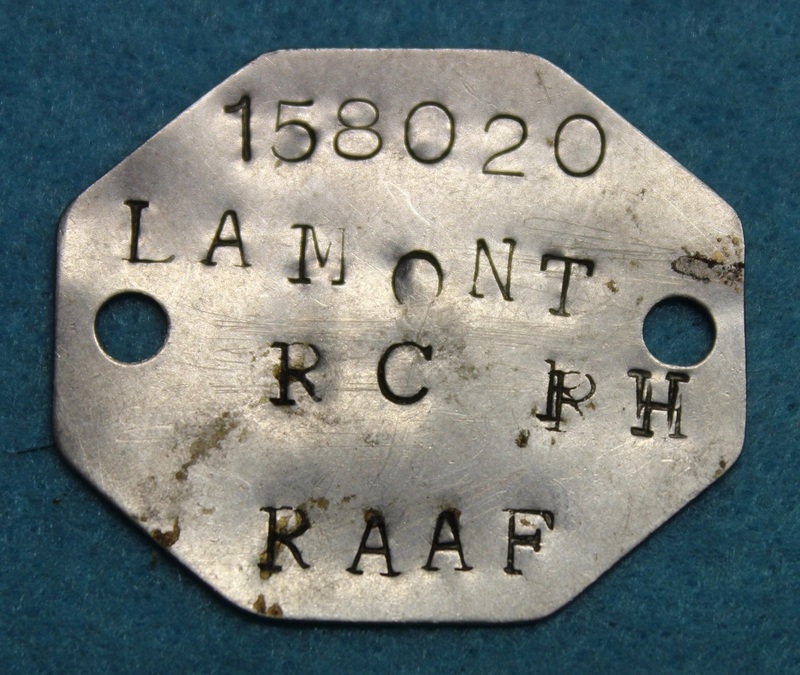 A single hexagonal official identity disc stamped 158020 LAMONT R. H. RC RAAF. Ronald Henry Lamont enlisted on 27 Oct 1944 at Melbourne and discharged with the rank of Leading Aircraftman on 8 Nov 1946 from RAAF Station Laverton. PI055. An official hexagonal identity disc engraved 91116 Barnes B P WAAAF pres 04. Beatrice Lillian Barnes enlisted on 4 Mar 1942 at Melbourne and discharged on 4 Feb 1947 as a Sergeant from Laverton Transit and Departure Section. PI056. 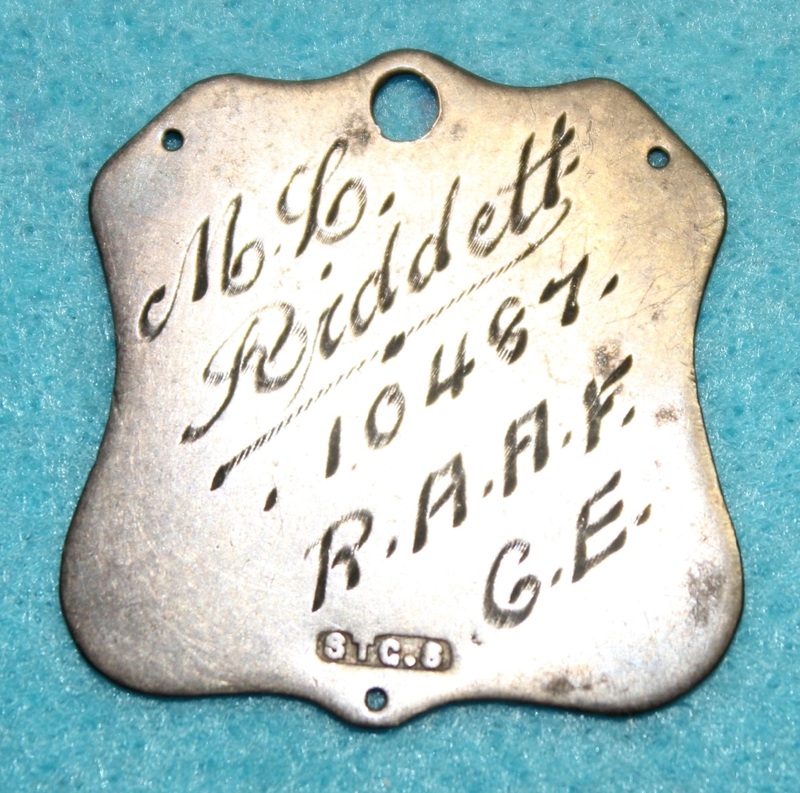 A small sterling silver shield shaped disc engraved M. L. Riddett 10487 R.A.A.F. CE 04. Maxwell Leonard Riddett enlisted on 10 Jun 1940 at Melbourne and discharged on 12 Oct 1945 with the rank of Sergeant from 2 Reserve Personnel Pool. PI058. 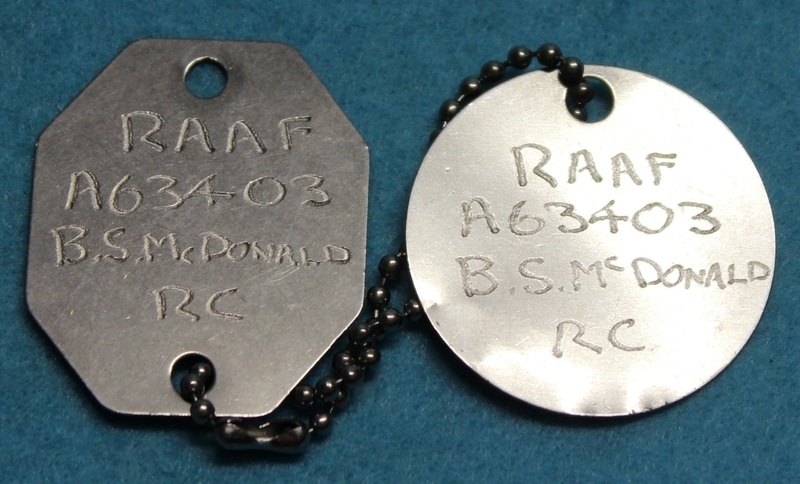 A pair of official identity discs engraved RAAF A63403 B. S. McDONALD RC A Pos. PI059. 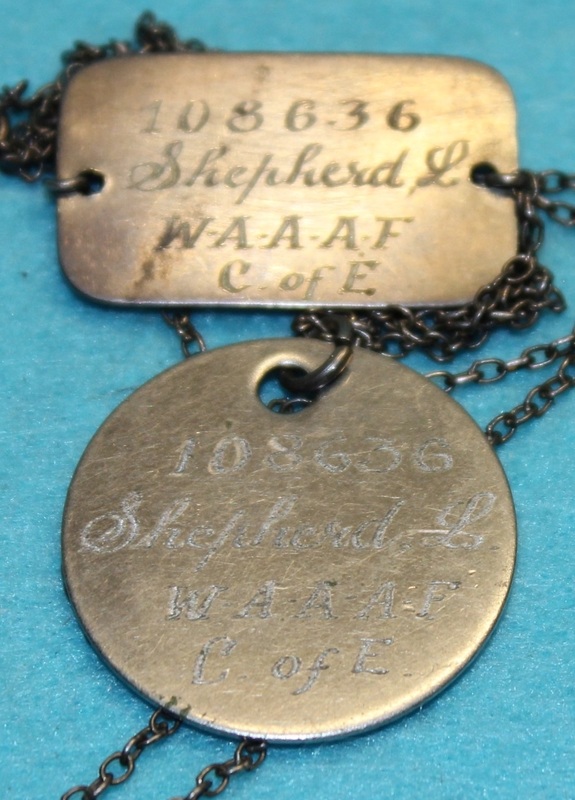 A pair of official identity discs stamped A5264 WALLINGTON R. C. R.A.A.F. A2 C OF E.
PI060. 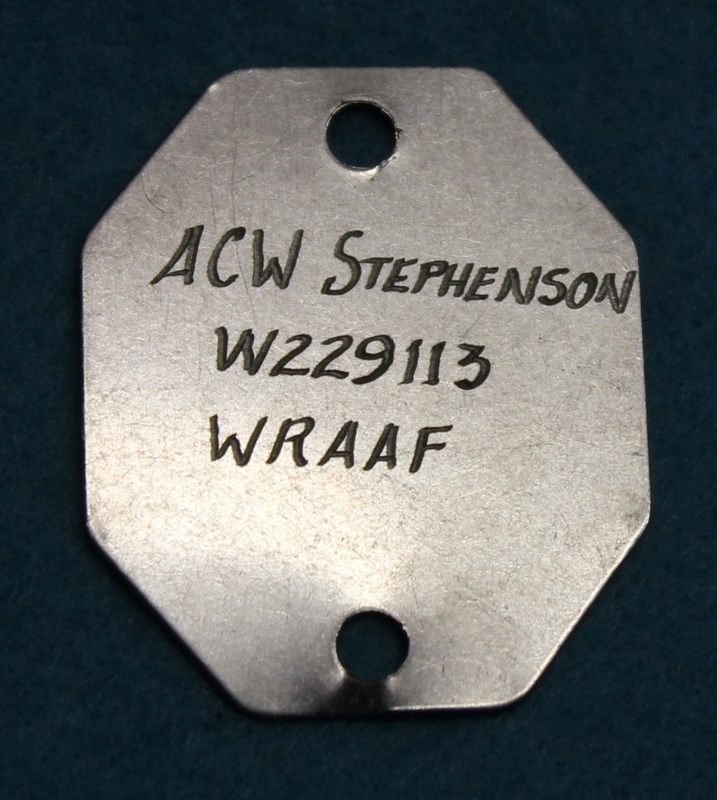 A single hexagonal official identity disc ENGRAVED ACW Stephenson W229113 WRAAF. PI063. 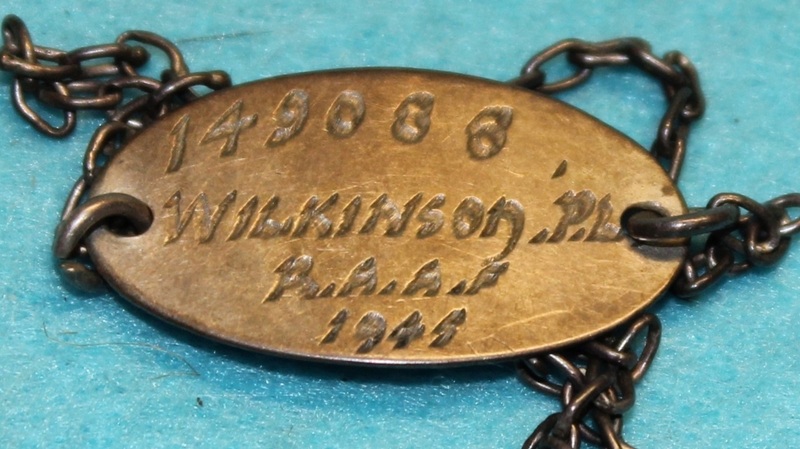 A large rectangular sterling silver identification bracelet engraved A21373 MILLAR RAAF. PI064. 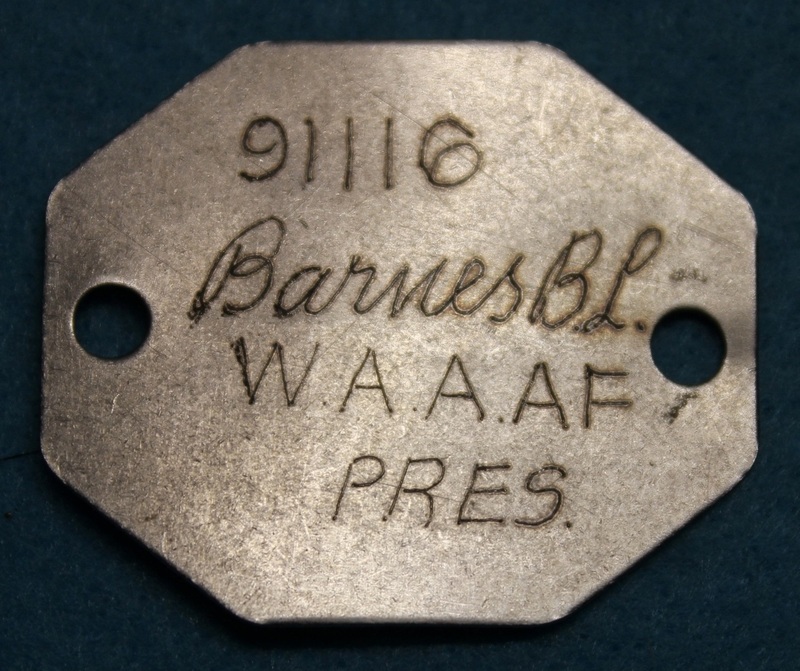 A large rectangular sterling silver identification bracelet engraved A. WESSLING RAAF. PI074. 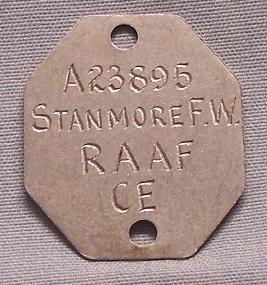 A single hexagonal official identity disc engraved A23895 STANMORE F. W. RAAF CE 0 Rh + VE. PI075. 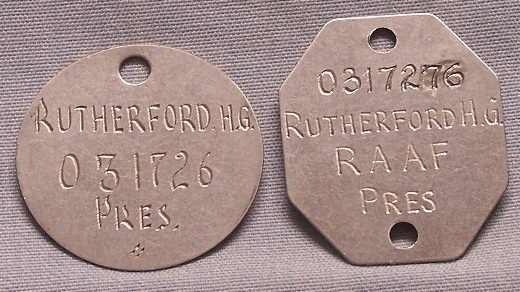 A pair of official identity discs engraved O31726 RUTHERFORD H. G. RAAF PRES O Rh – VE.